« Women Shooters of the World Unite! Well, actually it’s shark season all year round because the ocean is where sharks live. But as most humans don’t venture into the water much in winter we can consider the onslaught, so to speak, of the summer months as shark season. As regular KC readers know, despite its inland location Kookynie has a tradition of body surfing, practised these days by a small coterie of avid afficionados. Add ocean swimming practitioners and that makes a handful of alert citizens vigilant to the shark menace, so time for an update. According to University of Florida shark researchers, in 2010 there were 79 attacks on humans worldwide, of which 6 were fatal. This was the highest recorded in 10 years, and represents a 25% increase on 2009, but you’ve got to concede it’s a statistically small base. That’s kinda the good news: your chances of being attacked by a shark, particularly, for example, at netted metropolitan Sydney beaches are extremely tiny. The not-so-good news is that the south-western coast of Oztralia has witnessed three fatal shark attacks in the last year or more, so roughly half the worldwide fatalities have occurred on either side of the Great Australian Bight. Yeah, some pranksters might say that’s a spelling mistake! The latest was on a bodyboarder in September at Bunker Bay, in the vicinity of WA’s legendary Margaret River. 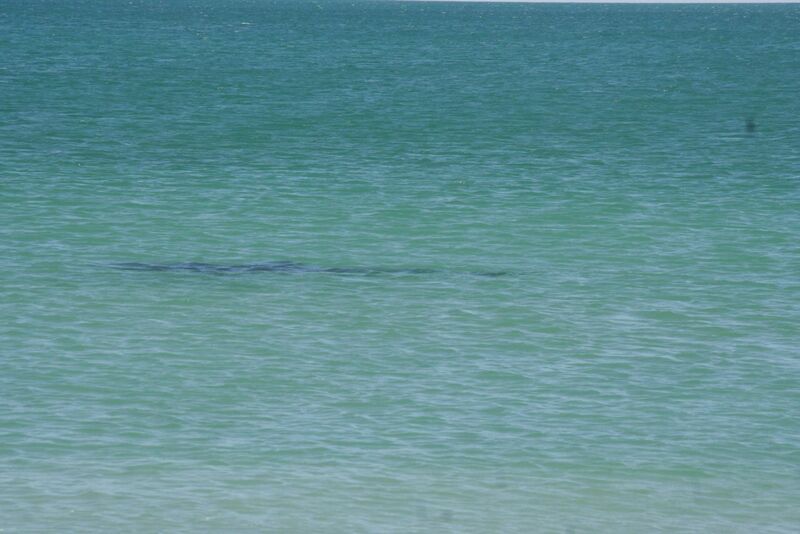 KC’s environmental travel team visited these southern and western coastlines back in 2009, and definitely experienced that ‘sharky’ feeling on many occasions – this photo of a tiger shark cruising in shallow water was taken in Shark Bay (oh yeah) in the exact spot we had just swum in! So, as the local ocean-going cognoscenti gather in the Kookynie pub, over a pint or three of KB (Kookynie Bitter, of course), sober (ha!) assessments are being made about the coming season’s risks. On those lonely Bight beaches, scanning ‘out the back’ before entering the water is serious. So holding out your right arm cocked at a 15 degree angle directly at the said predator is a proven way to deter the man eaters in all areas or is that just Kookynie? I’d be interested to learn about more arm and body gestures that might help keep me safe in the lead-up to peak shark season. Thanks KB! Yes, the stiff-arm technique developed on Kookynie’s rugby field has been successfully adapted to fending off the Bight’s aggressive Great White sharks, so no doubt will work with smaller Sydney-centric varieties. You have to appear confident though, otherwise the shark will sense your diffidence, and have another go! Well, the follower (that’s how we are called now in the time when posts are either liked or followed or both) still awaits the video footage of the sharks around tama from the camera strapped to KC’s head. After the average “jungfernfahrt” which almost ended in tragedy, will there be a second attempt? Hmm, good question, but waterproof camera miniaturisation may have to advance before the next attempt…..however the idea is not lost.